Lee Craven, executive chef for Lenoir Dining at the University of Mississippi, assists Mimi Driscoll, a senior from Winston-Salem, N.C., in plating a meal in the demonstration kitchen at the National Food Service Management Institute. Lenoir Dining has moved to NFSMI during April, while the facilities at Lenoir Hall are being renovated. UM photo by Nathan Latil. OXFORD, Miss. Patrons of the Lenoir Dining program at the University of Mississippi are getting a change of scenery, as the popular student-run restaurant has shifted its operation to the National Food Service Management Institute for April. The move is designed to enhance the learning experience for students who plan, prepare and serve meals for Lenoir Dining, said Mary Roseman, chair and associate professor of nutrition and hospitality management. 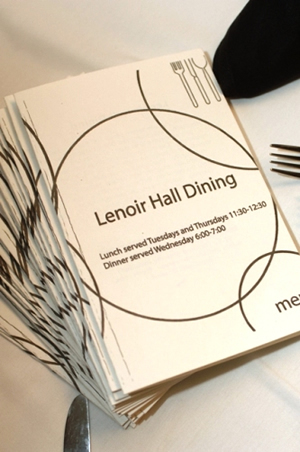 Lenoir Dining is a required laboratory for students majoring in dietetics and hospitality management. Students enrolled in the five-credit-hour lecture and lab of Quantity Food Production and Services learn by operating a 40-seat restaurant. The students do everything from menu and food preparation to managing the restaurant and serving all guests. The eatery, which is open to the public, normally operates in Lenoir Hall, headquarters of the Department of Nutrition and Hospitality Management. The location change to NFSMI gives students experience in a different kitchen environment, she said. Montee Gaddy, a senior nutrition major from Long Beach, likes the change of venue. The NFSMI demonstration kitchen is larger and better equipped than the one at Lenoir Hall, she said. Students in the program get to work both the back and the front of the restaurant, so they get experience preparing and cooking meals from start to finish, hosting and serving guests, and managing the overall operation. James Beard Award-nominated Chef Lee Craven is executive chef for the program, and students often get to work one-on-one with him when preparing meals. The department plans to update the Lenoir Hall kitchen this spring to enhance its functionality and capabilities, Roseman said. Lenoir Dining offers lunch 11:30 a.m.-12:30 p.m. Tuesdays and dinner 6-7 p.m. Tuesdays and Thursdays. Menus change from week to week, but every week features a choice of two salads, two desserts and three entrees, including a vegetarian selection. Entrees are $7.50 each, and salads and desserts are $1.50 apiece. Reservations are recommended and can be made by calling 662-915-1863. The dining program will operate at NFSMI through April 28, when it is scheduled to shut down for the semester, but it will reopen in June, staffed by students taking the Quantity Food Production class for the first summer session. The June location will be announced later. The National Food Service Management Institute, part of the School of Applied Sciences, is the only federally funded national center dedicated to applied research, education and training, and technical assistance for child nutrition programs. The institute was established by Congress in 1989 and funded by a grant administered through the U.S. Department of Agriculture’s Food and Nutrition Service. The institute’s mission is to provide information and services that help improve child nutrition programs. For more information on the Department of Nutrition and Hospitality Management, visit http://www.olemiss.edu/depts/nhm. For more information on NFSMI, go to http://www.nfsmi.org/. For menus or assistance related to a disability, call 662-915-1863.